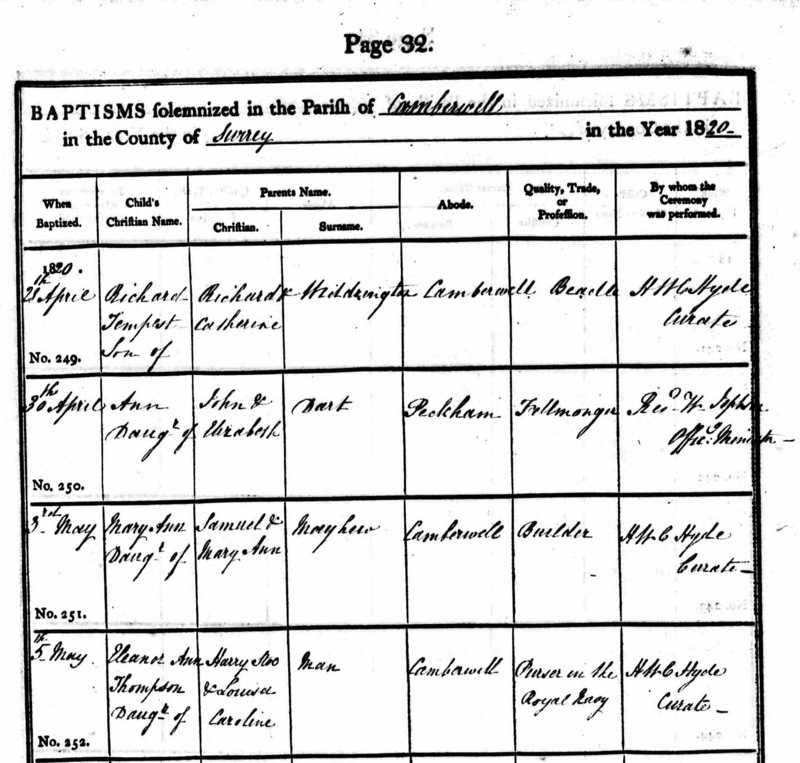 Eleanor Ann Thompson Man was born on 9 April 1820 at 33 Apollo Buildings, Walworth, Surrey, the eldest daughter of Harry Stoe and Louisa Caroline (Fowle) Man, and was baptized on 5 May at St. Giles, Camberwell, Surrey (4th and last entry below). 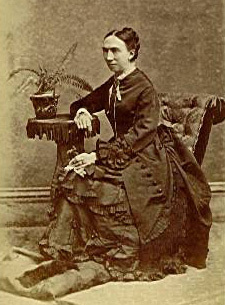 She married Morgan Thomas on 18 August 1869 at St. Margaret’s, Halstead, Kent. Eleanor died on 9 May 1894, aged 74, at Halstead Lodge, Carshalton, Surrey. 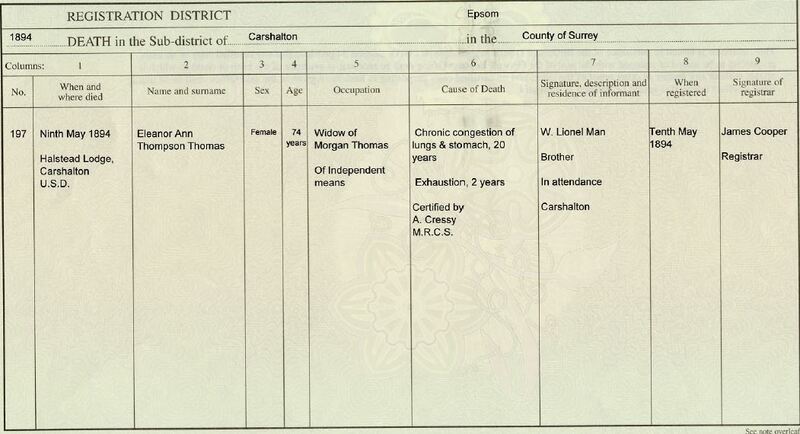 Morgan was the son of William Thomas. 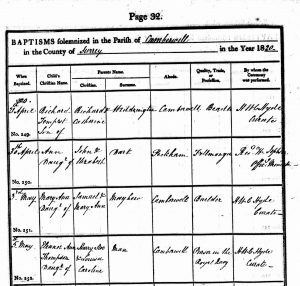 He was born 1816 in Tregrose, Glamorgan, Wales, at least as recorded by earlier Man historians, but the 1881 census indicates his birthplace as Boxted in Essex. He died on 23 September 1886 at Halstead Lodge, Carshalton. Eleanor and Morgan belong to Generation Five. There was no issue. [References: Her birth – Col. A. M. Man’s papers; her baptism – FHL# 0254573; her marriage – copy of record from film viewed at Kent RO; her death – copy of her death certificate.] Her will can be read HERE in PDF. He [William Lionel Man (Uncle Bill) ] used to take us boys sometimes for walks to Carshalton to visit his eldest sister Eleanor, “Aunt Nellie” who had married one Morgan Thomas and adopted the two daughters of her brother Harry when they were left orphans. Like all the Mans Aunt Nellie was a character a Protestant Dame of the deepest dye. She always seemed to be dressed in black though with a kind heart and grim humour. She had not the faintest knowledge of the management of children. 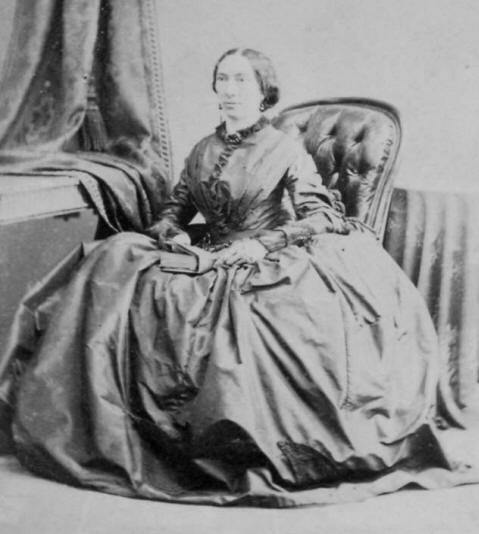 She was the only one of the family who had not travelled and she retained the dreadful religious outlook of a little country parish of the 1850s. Occasionally we three boys (Harry, Hubert, and Morrice), stayed with her and as the bath seemed always blocked up with Geraniums, Fuschias etc. (just as the parlour was over shadowed with Aspidistras). She installed a bath in the stable filled by the gardener with cold water; wither each morning we used to go for a plunge. She had a cordial disapproval of her brother Bill, as an actor, as married to a Roman Catholic, and as a man. She feared his influence over us youngsters and he returned the dislike and delighted in shocking her. She had a faithful maid / cook / friend one Martha an elderly acid protestant virgin who prided herself on keeping her kitchen spotlessly clean. On one occasion when we were staying there, uncle Bill turned up unexpectedly to visit his sister when she ‘Martha’ happened to be “out”. Uncle Bill at once mobilised us and (this sounds incredible but I am ashamed to say we helped to do it) we put lumps of coal on the spotless kitchen shelves and then hid, all four of us, to hear what Martha would say on her return. To our regret she was speechless with indignation. We had some fun at Aunt Nellie’s however in her garden and the field next door she had a pensioner, a very old sailor living in a little cottage and we spent hours with him. Alas I was too young then to remember how his conversation went but I still recollect the smell of the shag he used to smoke. Once, village boys came apple stealing and after one successful raid they tried another but we boys were on the watch and swooped upon the thieves with yells. They all fled but we cut off and caught one, we did not quite know what to do with him till Harry, I think, had a brainwave. We shut him in the empty refuse bin and held him there for a long time, taking it in turns to sit on the lid and keep him prisoner. Later when separation came because Harry & Hubert went to school I used to stay for weeks at a time at Carshalton and “was I lonely”? And frightened too at night though I never dared to say so. In the room where I slept, sharing it with a maidservant, there was a wardrobe over the top of which protruded the hilt of Colonel Garnet Man’s sword wrapped in black mackintosh. It looked by moonlight like the head of a black man looking down on me as I shivered in bed. I dared not be this grimly watched so I used to creep down stairs and sit outside the sitting room on the stairs in my white night shirt for hours, or so it seemed to me till sleepiness compelled my return. I was never discovered and I never said anything partly because in our nursery in the old bad fashion of today been always held up as an example of courage to my elders, Harry and Hubert when they got an attack of “bogey” fears. I did not dare confess to my own terrors. I used to share a bed in those days with one of the maids, which I disliked (just as much as I expect she did). One hot summer night I must have rolled up against her, anyway I remember the disgust with which I recoiled when I realised I had rolled up against her bare flesh. Aunt Nellie had no idea or understanding of children e.g. one night a non-conformist elder, a great adversary of the vicar’s came to supper. I was of course in bed, and later I was awakened and brought down stairs to recite in my dressing gown some poem or hymn or other for his benefit. I loathed the smug man in his black suit and ginger whiskers and later when I read Dickens “Pickwick Papers” I felt I knew all about Mr. Stiggins and hailed him as an old friend, or rather enemy. My loneliness at Aunt Nellie’s led to me reading a very great deal every book I could get hold of for I could read when very young I could read till my head ached there seemed nothing else to do as I has no companions. In justice to Aunt Nellie I ought to add that I heard afterwards that in order to help the family when the old Halstead home had broken up she married, much against her inclination a kindly man of some means. I never heard Morgan Thomas speak at all & I believe when I knew him he was ailing and non- compos! The fact that I was a very lonely little boy in those days and considered studious as I was always reading (I had nothing else to do). It did not occur to Aunt Nellie that I ought to get out daily – very long walks with Martha were not stimulating! Moreover I was always constipated. Aunt Nellie used sometimes to enquire about my intimate health in a way that embarrassed an unusually shy little chap and when I confessed to the fact it usually meant to a large dose of Gregory Powder which led to much Griping and painful results. She had a queer custom of giving me a penny each time I was “a good boy” – three pennies were put in a queer little knitted worsted purse – jug shaped with a collapsible twisted top. This purse was kept in the Parlour on the mantelpiece. I do not remember the results being given to me. I expect they went to Protestant Mission or some other cause anyway, as I have indicated, there could never have been much in the purse! Hubert Man recalls his aunt as follows. Eleanor Ann Thompson Man (Aunt Nellie) daughter of Henry Stoe Man was born on April 9th 1820 & christened at Camberwell; she married late in life a Welshman Morgan Thomas (to better the family fortunes it is said). As a girl she was a pretty brunette, very devoted to her brothers, full of fun, & deeply religious, her husband was a small wizened up man, I (HWM) remember him with a short grey beard; he was eccentric but very kind, he had been a great horseman, we always called him Uncle Toby, he had a habit of talking to inanimate objects, I remember Aunt Nellie telling us that she had found him talking to an old pair of boots, in which he had climbed mountains, as if they were old friends. Aunt Nellie was cheated out of 15,000 pounds by her lawyer a Mr Mustard; the fraud was discovered by Mustard’s son after his father’s death, the son wrote to Aunt Nellie asking her to support the wife & children, this Aunt Nellie did. She brought up the two children of her brother Harry. She lived for many years at Halstead Lodge Carshalton. We children used to go & stay with her, she loved a joke so we used to climb in over the garden gate & get in by the back door to surprise the old lady, & she would then make us hide under the table to give Our cousins Ella & Harriet a surprise too. She died in about 1892 I was then a boy at Rugby School, I had a very curious dream about her there. I felt her death very much & a day or two after I had heard the news I woke up to find the grey light of dawn just showing past the head of my bed round the window blind & Aunt Nellie was seated on my bed box close to the head of my bed, I was very glad to see her and not at all frightened, we talked but I only remember I asked her if she was in heaven & she said ‘Yes’ I then asked if I would get to heaven too she answered, ‘Yes after a very, very long time’. The dream was an amazingly vivid one. 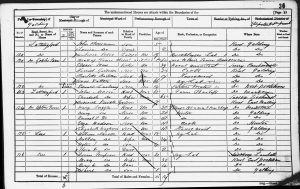 The three census records below are from: 1861, 1881, and 1891. To view the images more closely click on them. On the 1861 census the yet to be married Eleanor Man is staying at a house in Yalding near Maidstone. The owners are not in residence and Eleanor is staying as a ‘visitor’. 1861 Census for Yalding near Maidstone, Kent.